Your masonry chimney is an important part of your home’s curb appeal, and a damaged masonry chimney can take away from even the most beautiful home. That’s why it is important to have your masonry professionally repaired and maintained. This not only keeps your home looking beautiful, but also keeps your chimney operating as safely as it should! Water: Moisture from rain, snow and ice can be extremely destructive when it comes to your masonry. If your masonry absorbs water, it will expand when it freezes and contract when it thaws. This creates progressively larger and larger cracks, chipping and spalling. Age: The older your chimney is, the more likely it is going to need repairs. Even well-maintained older chimneys are more prone to masonry damage. Of course, many older homes – especially those in need of major renovations – may not have been receiving adequate chimney maintenance or upkeep.  We are proud to offer a wide variety of masonry repairs and services to help keep your chimney and fireplace looking beautiful and working as safely as intended. 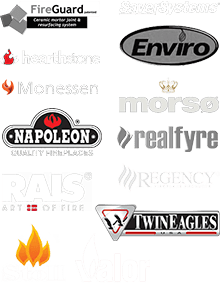 Rebuilds: Whether you want to create an entirely new look or your chimney is no longer structurally safe, we can rebuild your fireplace and chimney properly and in a time-effective manner. A rebuild will allow you to create a custom look that is totally unique to your home and style. Spalling Repair: Damaged brick may fall away from the fireplace or chimney in a process known as spalling. When this occurs, the missing bricks need to be replaced in a material and manner that allows them to blend seamlessly with the existing masonry. Firebox Repair: Your firebox is exposed to some pretty high temperatures and corrosive byproducts, but oftentimes firebox damage is a result of a chimney leak or house settling. If your firebox has been damaged, do not use your fireplace until repairs are made. Tile Repair: Chimney tiles are designed to take on high heat, but oftentimes, these see damage over time or as a result of a chimney leak. If the tiles in the liner of your chimney or at the top of your chimney are damaged, we can make the necessary repairs to restore the safety and function of your system once more! Let Olde Towne Chimney Repair Your Masonry! Our expertly trained masons can restore your fireplace and chimney properly and affordably. Call us today at 812-284-0123 to schedule your masonry repair appointment – you can also request an appointment here! The need for smoke chamber repairs can show up as smokey smells and inefficient operation. Maybe it’s time you had your smoke chamber inspected for possible chimney repairs.